I began experimenting over a week ago with the idea of bringing my Three Ghost Friends: Learn About Colors eBook to life with a homemade light box. 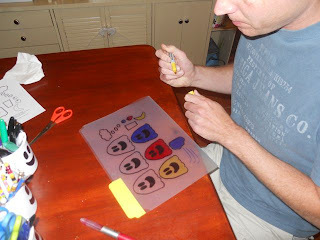 My goal was to provide an inexpensive way to allow my children to retell the story and experiment with mixing primary colors to make secondary colors. 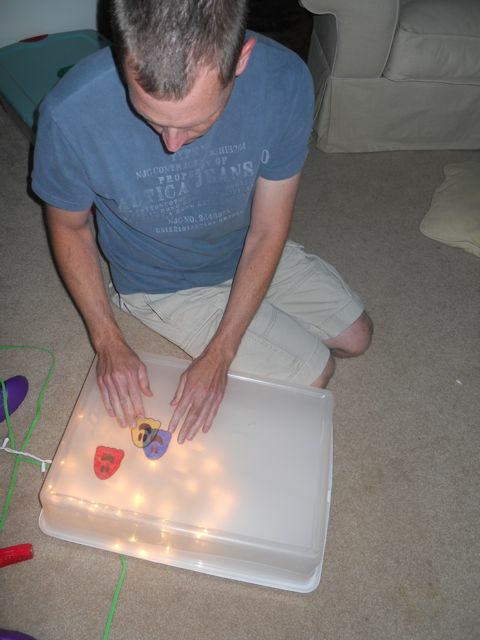 First, I needed a homemade light box. 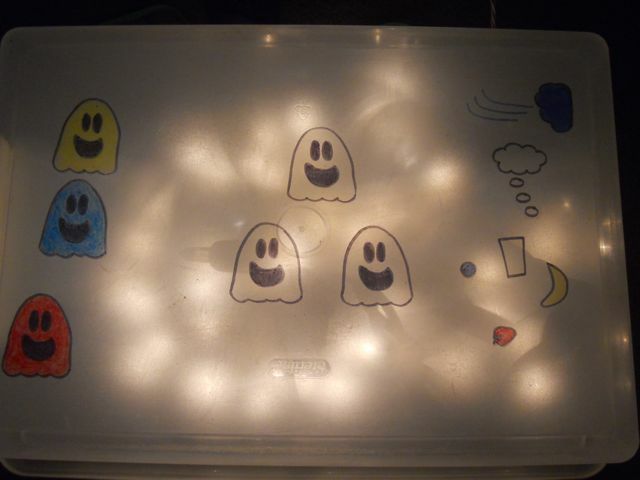 I found an unused clear storage bin in our basement and a set of clear Christmas lights. I placed all the lights inside the box except that I left enough outside the box to reach the plug. I snapped on the lid and flipped the container upside down. I thought to myself, "That was easy enough!" 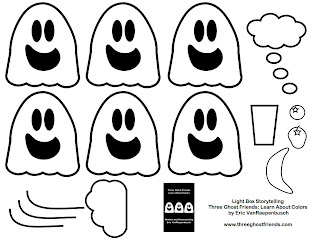 Next, I needed Three Ghost Friends and other essential storytelling items from the eBook. 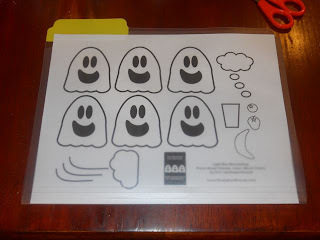 I made the printable sheet below which includes the outlines for 6 ghosts (3 white ghosts, and 3 primary color ghosts), a thinking bubble, a glass of milk, a blueberry, a strawberry, a banana, and a windy cloudy. Everything was going smoothly up until this point. I hadn't spent any money and wanted to keep it that way. I now needed a way to demonstrate the color mixing and I didn't want to buy colored transparencies or colored film -- even though I knew in the back of my mind would be the best way to accomplish this idea! I had some clear file folders that I thought could work. I slipped my printable sheet into the folder. Then, with a black Sharpie marker I traced all the items on the sheet. Next, I added color to the outlines. 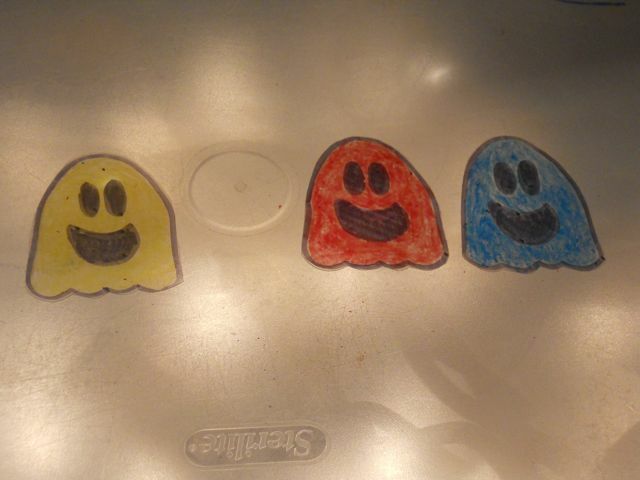 I needed a blue ghost, a red ghost, and a yellow ghost. In the eBook, the ghosts turn colors after eating a blueberry, a strawberry, and a banana. 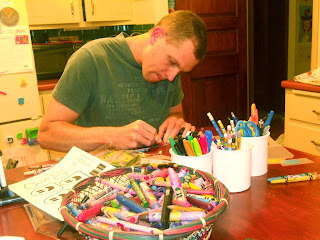 I colored those too. I did not color three of the ghosts, the thinking bubble and the glass of milk. Lastly, I colored the windy cloud blue. 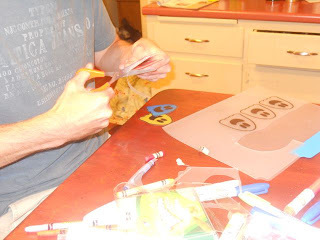 Then, I cut out each item. 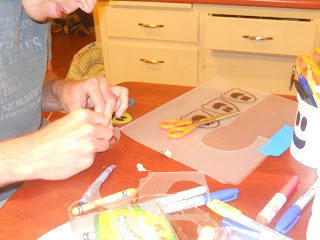 I was feeling pretty good and thought I had succeeded in making a storytelling kit with things from around my house. 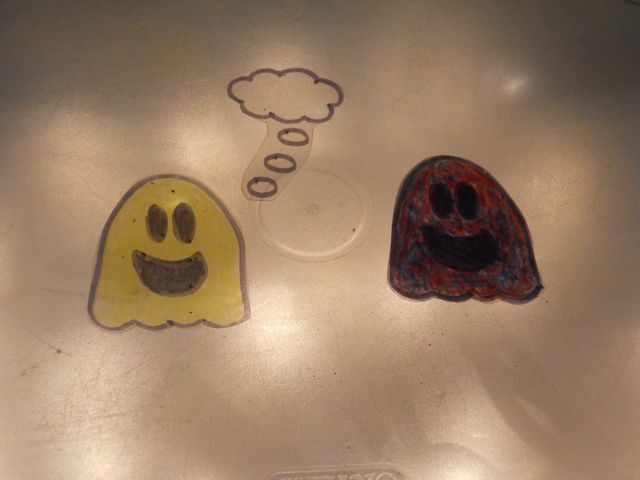 I overlapped the Sharpie-colored ghosts to create the color mixing effect. I didn't like what I saw so I headed to the light box. The colors weren't mixing as well as I would have liked. I think the blue Sharpie marker was too dark and the yellow marker was too light. So, I went back to the drawing board. This time I tried Crayola crayons to color the blue, red, and yellow ghosts. Coloring with crayons did not leave as smooth of a finish as the Sharpie markers, so I colored on the front and back of the ghost shape to fill in the best I could. 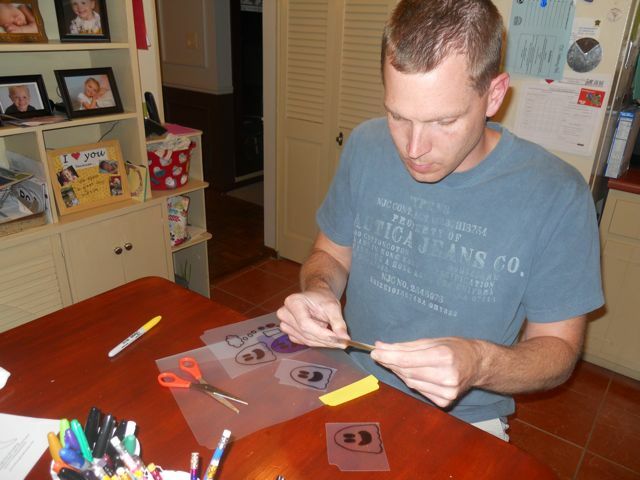 I was not confident that this idea was going to work as I cut out this set of colored ghosts. However, to my surprise, it worked! 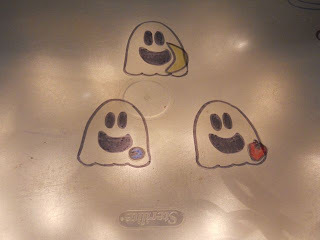 I was pleased with how the Crayon-colored ghosts looked on the light box. The crayon-colored ghosts definitely showed the color mixing better than the Sharpie. After my success, I tried the first part of the story. The Three Ghost Friends eat fruit. He said, "BOO!" and scared the ghosts apart! My project was a success! 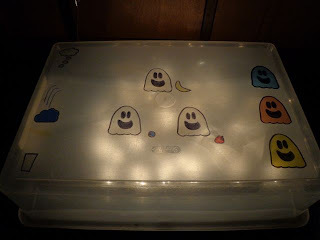 Three Ghost Friends: Learn About Colors can be retold with a clear storage container, a set of clear Christmas lights, a clear plastic file folder, a black sharpie and three crayons! 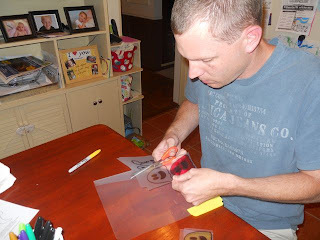 However I have to say that after I did all this experimenting late into the night, the next day my wife went to a garage sale and found colored transparency film! My initial thoughts about the project were confirmed, after tracing the Three Ghosts Friends on the red, blue, and yellow transparency film. 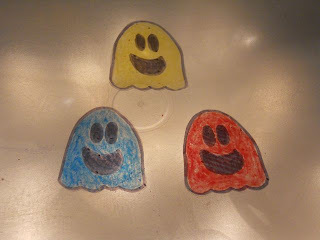 The color mixing was even better with the transparency film than with the crayon-colored ghosts. But, both can be effectively used for Light Box Storytelling! 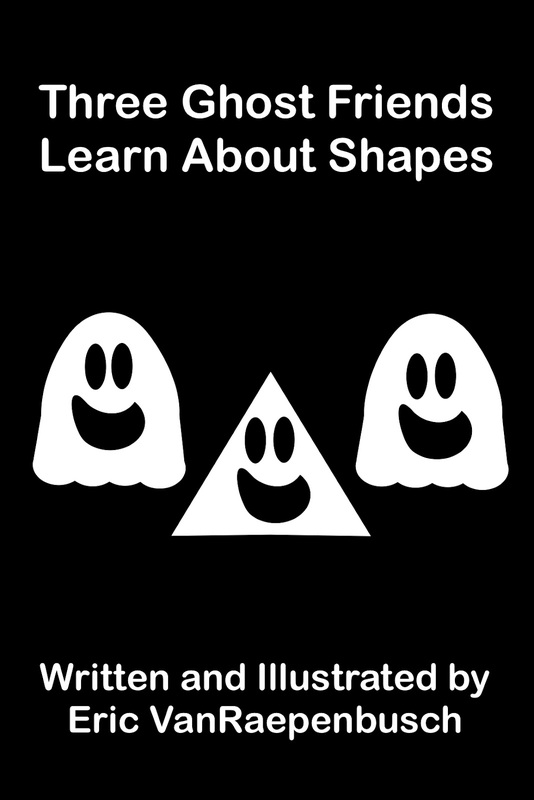 I shared this whole "lengthy" story hoping that you will download my Three Ghost Friends: Learn About Colors eBook (for iPad and iPhone), read it with your child, and use materials you may have lying around your house to make a light box storytelling kit. 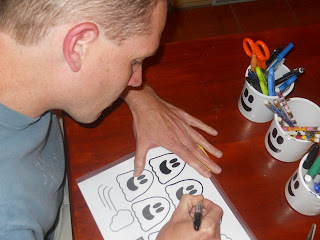 Random thought: I think the Lightbox Storytelling was subconsciously inspired by one of my favorite children's authors - Steve LIGHT. He has developed some very cool storytelling boxes that are available from Guidecraft. Deb, I am very thankful for your support! very cool that you made it all with materials you had around the house. I've told a similar story and used large pieces of tissue paper to show the colours. Although I like that when you put one coloured ghost over another the colour changes - great.